Tesla has made more changes to is Model 3 line up and online ordering, which also affects those in Canada. The company has removed the base Model 3 at $35,900 CAD after savings and incentives in Canada from online orders, as you will now need to call in or visit a Tesla store to place the order. This entry Model 3 was under the Rear-Wheel Drive Standard Range configuration. Tesla says the upgraded “Standard Plus has sold at more than six times the rate of Standard, far exceeding our expectations.” The Standard Plus retails for $42,000 CAD before gas savings and incentives, or $53,700 CAD without. For this reason, “We’re making these changes to ensure that our online order process is focused exclusively on the three Model 3 variants customers want most,” explains the company. Tesla says Standard customers will have the choice to upgrade to Standard Plus “at any time”, while existing customers who purchased a Standard Plus can downgrade as well, with the company ready to provide a refund of the price difference. The decision to remove the base Model 3 from online orders will “simplify our production operations to better optimize cost, minimize complexity and streamline operations.” Tesla says Model 3 Standard deliveries will begin this weekend. 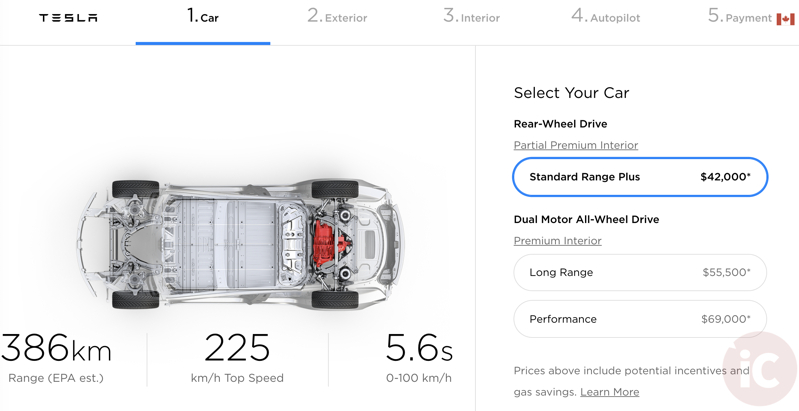 The new Model 3 Standard Plus used to cost $38,600 CAD but now is priced at $42,000 CAD with Autopilot, saving you $600 CAD (Autopilot normally is a $4,000 CAD add-on at time of purchase). Also new for the United States is leasing for Model 3 owners, according to Tesla’s Thursday night press release. No other details were provided regarding the highly-anticipated Tesla ride-hailing network, but the news comes just ahead of Uber’s planned initial public offering (IPO).